Held each fall in conjunction with the WSU Career Expo, the VCEA Technical Career Fair connects companies and professional recruiters with students and job seekers to help them achieve their career goals. From freshman to senior and beyond, there are opportunities for you. Many participating companies are looking for interns, co-op students, and employees, so there really is something for everyone. Increase your visibility to potential employers. Identify temporary and permanent positions within interesting organizations. Make informed decisions and educational choices to help prepare for employment. Connect with the Internships & Career Development Office. Research your favorite employers on Handshake. Each fall and spring, WSU’s Academic Success and Career Center hosts a campus-wide Career Expo. Typically more than 100 recruiters attend from all types of organizations. 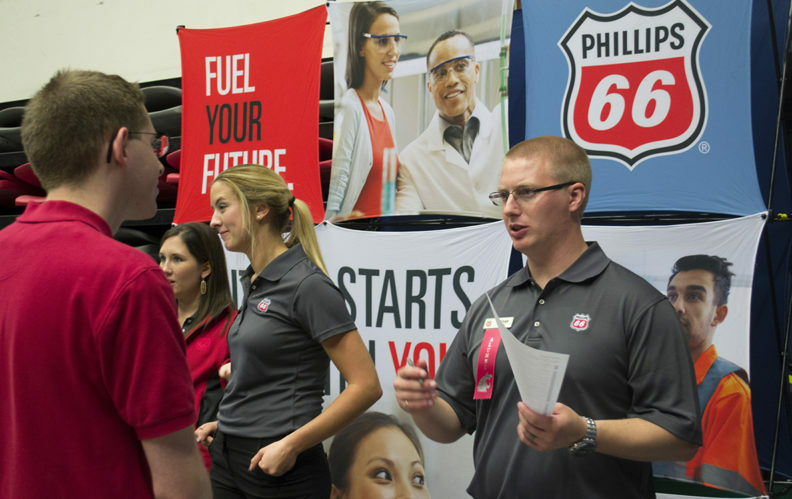 Learn more about the Career Expo. Let us help you connect with our students, post your positions, and set up on-campus interviews. Email Sandi Brabb in the Voiland College Internships & Career Development Office. Register for the Career Expo and VCEA Technical Fair.